On March 2nd students from St. Mary’s Preparatory in Orchard Lake triumphantly returned, as American stars, from the first cultural/music exchange program at the renowned Stanisława Moniuszki National Music Academy in Bielsko-Biala, Poland. Performing at the 17th annual LOTOS Jazz Festival, one of Europe’s premier festivals, they played on the same stage as international jazz greats, like 10-time Grammy winner, Wayne Shorter and Grammy winner Esperanza Spalding. After 10 fun-filled days studying, performing, sight-seeing and making friends, it’s safe to say that it will difficult for the boys to forget their experience. Marcin Chumiecki, director of The Polish Mission, and Josh James, director of the St. Mary’s music department, met several months ago with an idea: How can we get a group of kids to Poland to experience the culture we work so hard to remember and promote to the students at St. Mary’s? “At The Polish Mission, our daily goals encompass the idea that we celebrate our Polish roots, while promoting the modern society in Poland that really isn’t so much different from culture in America,” said Chumiecki. “It’s truly through our experience at The Polish Mission and our cooperation with St. Mary’s Preparatory that created this opportunity to present the best of Poland for the first time to these students. We hope that through the extensive groundwork that has already been laid, we will be able to make this experience an annual event,” he said. With Chumiecki’s assistance, James presented the program to the Edward and Josephine Wikiera Foundation, highlighting the great benefits the students would receive, culturally and academically. The Foundation members saw the uniqueness of this experience and provided major financial support towards the trip, helping a group of 26 Americans, men and women of St. Mary’s, to see Poland for the first time. Chumiecki said that the academic music partnership would not have been possible without the vision of Academy Director, Professor Andrzej Kucybała, Deputy Director Barbara Cybulska-Konsek and Big Band director, Tomasz Janusz. “Our students were offered a full-fledged, exciting academic musicianship while they were guest students at the Academy,” said Chumiecki. James added “The hope is that, going forward, music will be the thread that continues to unify the two cultures, through rare opportunities for performance on the international stage.” James prepared recognizable American jazz pieces (some with Detroit influence), modern, and classic jazz selections with his students in the months before departure. He even made sure to send the music to the teachers and students at the Stanisława Moniuszki Academy so the Polish and American students could perform together during classes. What began as a partnership with a prestigious music school in Bielsko-Biala, turned into a very exciting invitation to perform at the LOTOS Jazz Festival. 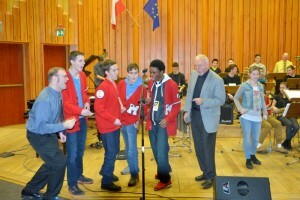 Through gracious support of LOTOS Jazz Festival director and association president, Jerzy Batycki and Mirosław Szklarski, association vice-president, festival promoter and logistics manager, the St. Mary’s Preparatory Jazz Band performed in a packed auditorium to an audience of more than 400. Many more were turned away at the door, as the performance was standing room only, everyone clamoring to hear the jazz band from the Orchard Lake Schools! “I was so excited and privileged to present our Detroit culture, in collaboration with The Polish Mission, at this international festival,” said James. As a native Pole, Chumiecki accompanied the students and parent chaperones as the Polish Mission representative and their personal guide around his hometown of Bielsko-Biala, including a city tour of Krakow and a visit to the Auschwitz-Birkenau State Museum, with which The Polish Mission has an exclusive partnership. The students had the opportunity to trace the steps of Pope St. John Paul II, through his beloved Krakow, in the year of the tenth anniversary of his death.